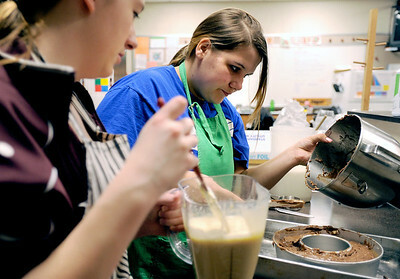 Sarah Nader - snader@shawmedia.com Marengo students Elizabeth Iversen (left), 16, and Jaci Dauphin, 16. work together to make a chocoflan while preparing classic Mexican dishes in Mary Sager's culinary arts class at Marengo High School on Wednesday, February 29, 2012. Sarah Nader - snader@shawmedia.com Teacher Mary Sager (center) helps her students, Abe LaMontagne (left), 18, and Argeniz Diaz Granados, 17, make a traditional Mexican soup during Sager's culinary arts class at Marengo High School on Wednesday, February 29, 2012. Sager was recently selected as Food Educator Network International Teacher of the Year. 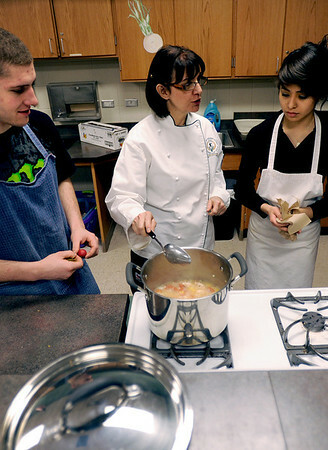 Teacher Mary Sager (center) helps her students, Abe LaMontagne (left), 18, and Argeniz Diaz Granados, 17, make a traditional Mexican soup during Sager's culinary arts class at Marengo High School on Wednesday, February 29, 2012. Sager was recently selected as Food Educator Network International Teacher of the Year.